AMD today took wraps off a processor family that constitutes arguably the company's most important launch in years. Codenamed Naples, that family is now known as AMD Epyc. Epyc represents AMD's firm intentions to return to the x86-based server market dominated by Intel after the effective demise of the Opteron chips from a heyday in 2003. Appreciating that Intel holds a near monopoly in server-class CPUs and chipsets, AMD has much to gain and little to lose. We'll discuss the various models, talk through the architecture underpinning Epyc, evaluate benchmarks provided by AMD on a Tech Day yesterday, and then see if Epyc, as an ecosystem, has the wherewithal to challenge the incumbent Intel Xeon chips that hold market-share hegemony. 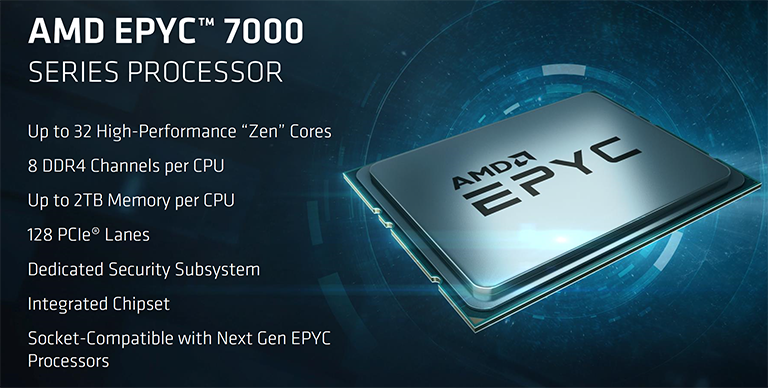 Going from the highest levels of details and working our way in, AMD productises Epyc into a 7000-series family consisting of nine processors ranging from eight cores and 16 threads through to 32 cores and 64 threads. Targetting the meat of the server and premium workstation market means that two Epyc processors can be run on a single board, or 2P in server parlance, offering up to 128 threads in a top-level configuration. AMD's research indicates that 95 per cent of x86-based servers fall into the 1P-2P category. The meagre core count of the Epyc 7251 processor is deliberate in two ways: it provides the cheapest path to these server processors and is designed for systems where the per-core cost of licensing relevant software is a budgetary concern. Rising up the stack brings with it the goodness of more cores/threads and speeds. 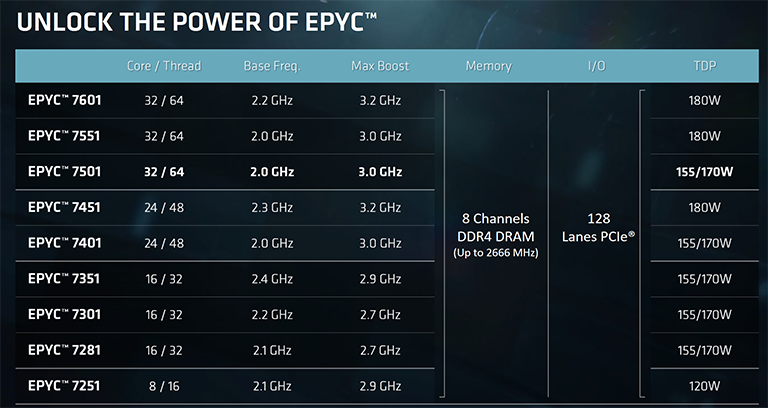 Epyc 7281, 7301 and 7351 all share the same 16C/32T topology but run at different base and boost speeds as well as different power budgets. The reason for the latter, explained AMD's Scott Aylor, is down to the speed of the memory controller resident within the processor, as operating it at DDR4-2666 consumes more power than, say, DDR4-2400, hence the 180W and 155W ratings, respectively. We can conjecture that AMD is binning Zen cores at the wafer level in order to determine those with the best frequency-to-voltage characteristics. These are then kept for Epyc chips, enabling up to 32 cores to run at solid speeds whilst the whole package consumes less than 200W. The fastest, and most expensive, trio all house 32 cores in what is known as a multi-chip module. Again, final speeds dictate pricing and comparison against extant Intel Xeon processors. AMD's research indicates that 25 per cent of servers ship with just a single CPU in situ, so for markets where only a single processors is necessary - and workstation and entry-level server springs to mind - AMD is also offering a trio of Epyc chips that are fused at the factory to work as uniprocessors. The Epyc 7551P, 7401P and 7351P are otherwise identical to their 2P-capable brethren though are priced lower in order to gain market share in these environments. Every Epyc processor uses an SP3 LGA socket - where the pins are on the motherboard, not the processor, contrary to desktop Ryzen - and AMD has confirmed that two future, improved Epyc models, codenamed Rome and Milan, will also maintain socket compatibility for simpler upgrading. Though we call them processors, it would be more accurate to refer to Epyc as an SoC (system on chip) as each package integrates all of the IO functionality and memory controllers. Speaking of memory, a fully-populated Epyc chip can handle two Dimms for each of its eight channels, so 16 in total, or 2,048GB (2TB) when using 128GB sticks. We'll see just how the motherboard guys get around creating standard-sized boards for two massive Epyc processors, a potential 32 Dimms for memory, and numerous slots for IO.